July 10 2008 will be remembered as one of the most dramatic days in the recent history of Bukhara. International community has been alarmed by series of blasts at the missile and artillery depot in the Kagan city military base in the Bukhara region. Missile shells were landing in different parts of the city scattering around numerous deadly splinters. The power of explosions could be felt in the regional center Bukhara where windows were shattered and civilians stunned with roar of artillery blasts. -	Unofficial estimates do not match with those from officials. I cannot provide exact numbers, but I can say that Bukhara regional clinical hospital and medical emergency centers are full with injured from Kagan. Cardiology and oncological hospitals are being temporarily freed of their own patients to be able to take people coming from Kagan. Some doctors told me there have been many cases of heart attacks among the arriving. I do not have verified information about deaths, but witnesses from Kagan say that number of casualties is much higher. Only among those who were fleeing the site nearest to the military depot five got killed. -	Have there been more civilians injured than military personnel? -	Is the military depot located near apartment houses? -	It is not in the city center, but also not far away from apartment blocks. According to Kagan residents I spoke to, a five-stored building and a hospital close to the military unit were destroyed in blasts. Possibly, all who lived near the depot are not any longer alive because their houses were razed to the ground, eyewitnesses say. Most of the injured arriving to Bukhara hospitals lived two-three kilometers away from the depot. Houses of some of them got severely damaged by missile splinters. -	Official version says there was only one explosion. -	Oh, no! Maybe there was one really strong blast, but there were many others that were breaking windows in the apartments of Bukhara. The first explosion at 1.48 am could be felt in the city center of Bukhara where I live. In the beginning there were about 30 blasts in a row and then they continued with less intensity until 10 o’clock in the morning. -	How far do you live from the epicenter? 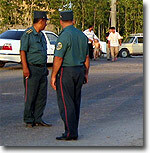 -	I live in the city center of Bukhara, which is approximately 20 kilometers from the military base. Our three-story building was literally shuddering in the blast wave. It was so scary I can’t even describe it. We were closing our ears, windows were breaking into pieces, there was silence for a moment and, then, another explosion. -	I was told that railway stations in Kagan were completely demolished; this is why railroad communications in Bukhara is cut off for an indefinite period with other regions. -	Eyewitnesses from Kagan said the station is gone. -	Was Bukhara the only place where people were evacuated? -	Yes, it was. People were accommodated in the buildings of Bukhara colleges, schools and kindergartens, which are empty now. There is almost no one left in Kagan. -	What about the local administration? -	The local administration was responsible for dealing with evacuated residents. They have been really polite and understanding. They really tried to comfort people and provide help, especially to those who lost their family members while hastily leaving the city. So now, people are provided with food and water. -	What did officials say to Kagan residents about returning to their homes? -	Some were promised to be returned to Kagan by 5 pm today [July 10], others were told they would have to stay for two to three days in Bukhara until the city is cleared of missile shells. -	How is it in Bukhara now? Are there many policemen and military forces in the city? -	No, it is quite the opposite, in my view. There are very few law enforcement officers in the city now. Most of the policemen were sent to Kagan to restore security. The city is calm and feels empty as many Bukharians left their homes for the countryside, fearing another series of blasts that are expected to be much stronger and to affect Bukhara badly. People want to wait until the threat is gone. Now many shops and restaurants are closed and the city is empty. -	Can one leave Bukhara freely? -	What do people say about what caused these explosions? -	First, people thought that the oil base in Karaul Bazar [in the Bukhara region] was ablaze. Then, some were thinking that there was an air crash or blast from one of the tankers at the railway station. But, when people learned that it was at the military base, they immediately thought of a terrorist act, as this unit has always been under tough security by considerable military forces. This is another reason no one believes that only three were killed. There are many soldiers at the base and they could not leave when the blasts occurred.